Wrap any decent Yamaha in a good King Kenny livery, and you’ve got an instant crowd-pleaser. 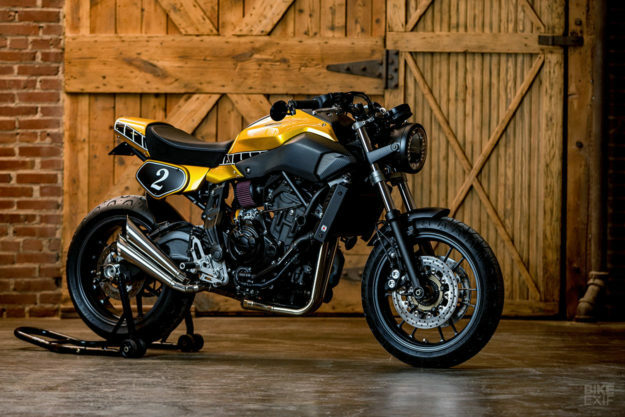 But this Yamaha MT-07 from Greg Hageman is much, much more than just a pretty paint job. 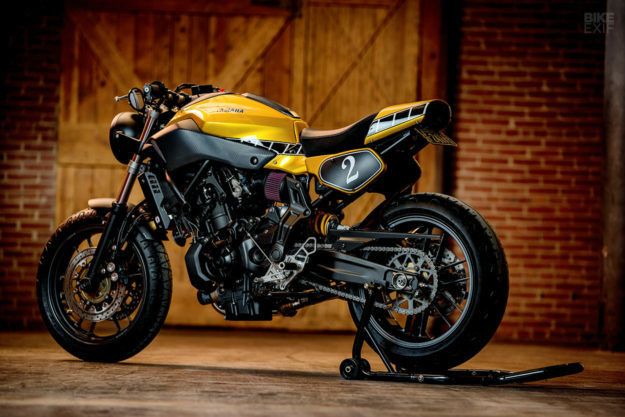 It’s one of the most successful MT-07 conversions we’ve ever seen. 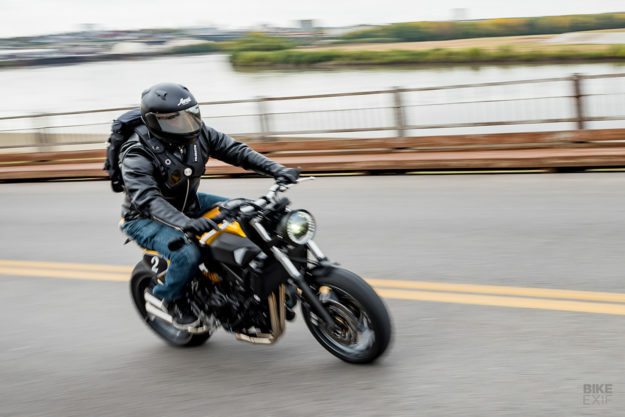 We’re used to featuring XSR700s on these pages, but the MT-07 (previously known as the FZ-07 in the States) is essentially the same bike. 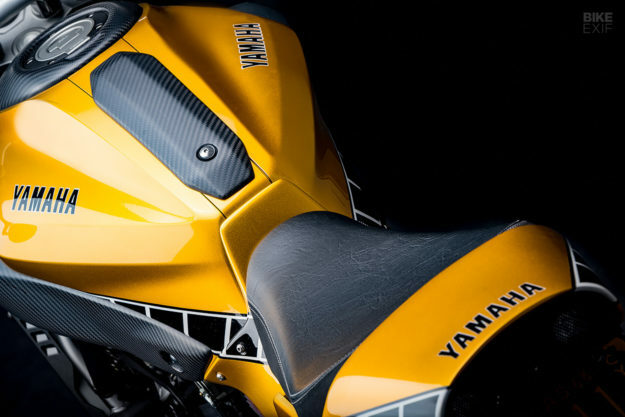 Its 689 cc parallel twin motor is lively, its chassis is nimble, and its price tag won’t hurt your wallet too much. You just need to tweak the styling—which Greg has done with a master’s touch. 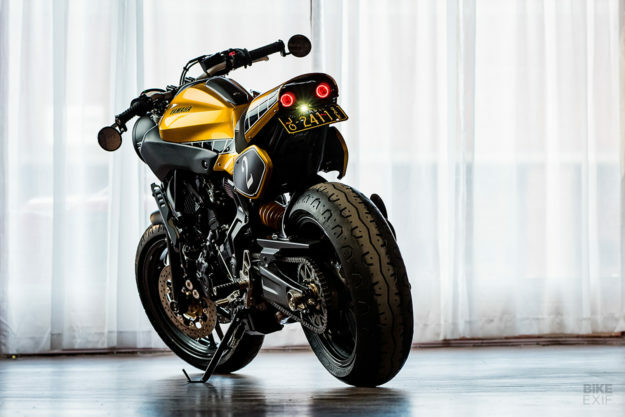 This particular MT-07 is a 2017 model belonging to Michael Martens, and it’s the fourth Hageman-built bike in his garage. (The first was a Virago that graced the cover of one of our previous calendars). The project fell into Michael’s lap through pure serendipity. He happened to be with Greg, when Shun Miyazawa from Yamaha USA stopped by to discuss a couple of Yard Built projects. Greg ended up with the MT-07 and an XSR700 in the garage, and started working on both. 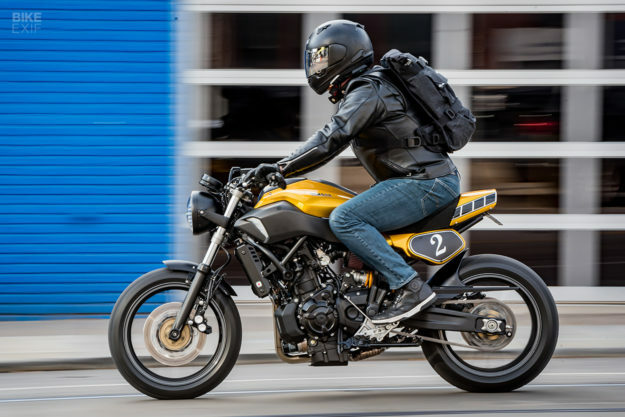 The MT-07 isn’t quite as neat and tidy as the XSR700, with a more plastic, layered design that presents aesthetic challenges. So while Greg didn’t faff around with the actual tank panels, he did tweak bits and pieces around them. That included replacing all the black plastic bits with matte carbon fiber parts from Powerbronze. The rear end saw a more radical reworking. Greg rebuilt the subframe, then fabricated a steel tail section that included a pair of side number boards. 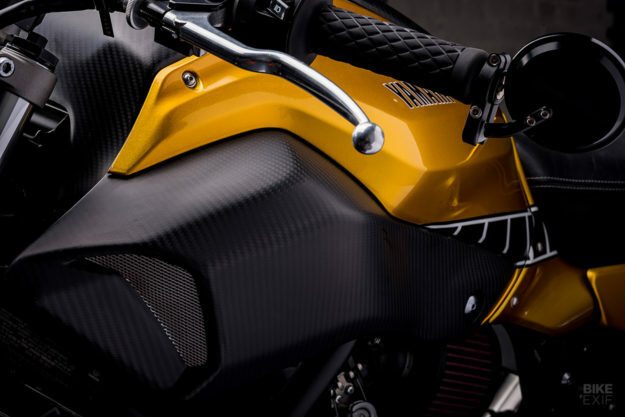 The actual seat is a solo unit from the XSR700. Out back, he embedded a pair of round LEDs behind a mesh screen. “They evoke a trend used on Ferrari 488s and the late model Ford GT,” says Michael. The front lighting is equally classic, with a big round bucket packed with LED internals (including integrated turn signals). Greg’s matched his work on the rear half of the MT perfectly to the stock lines—but there’s also a ton of subtle changes that push this build over the edge. 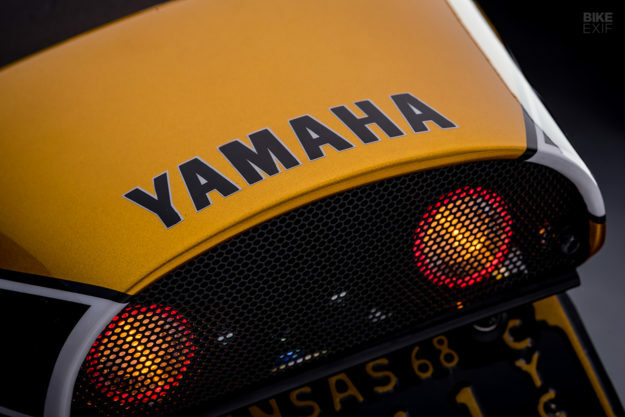 Look closely, and you’ll notice that the Yamaha’s modern hoops have been switched for classy split-spoke numbers from Exact. 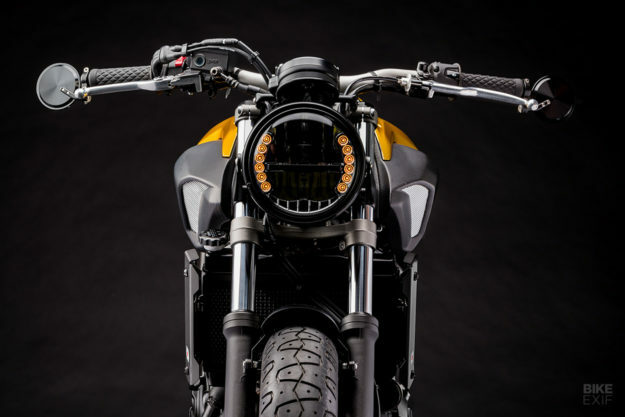 And they’re wrapped in Pirelli Phantoms; the same retro-inspired rubber that the XSR700 wears. Michael pitched in here too, sourcing a set of Brembo brake discs so that he could get rid of the stock—and modern-looking—wave discs. Greg then installed different radiator side covers, and moved the rear brake reservoir to under one of the number boards. There’s also a front fender from Rizoma, and a rear hugger from Puig. With all these changes, the MT’s digital stock speedo stuck out like a sore thumb, so it was swapped out for the round unit from the XSR. The cockpit also got a set of Triumph Speed Triple bars, Pro Taper risers, Biltwell Inc. grips and a pair of bar-end mirrors. 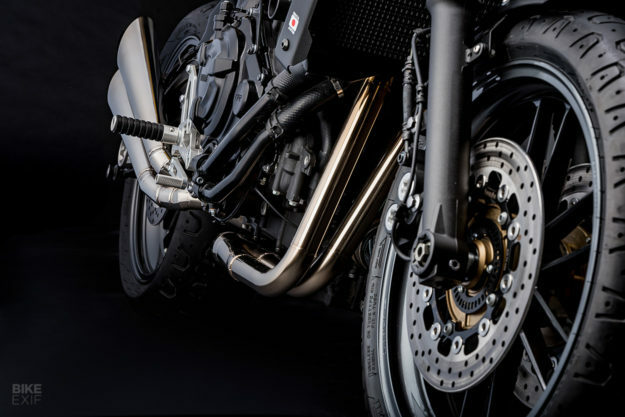 The exhaust is a full stainless system, made by Jake Green of Mantra Moto. 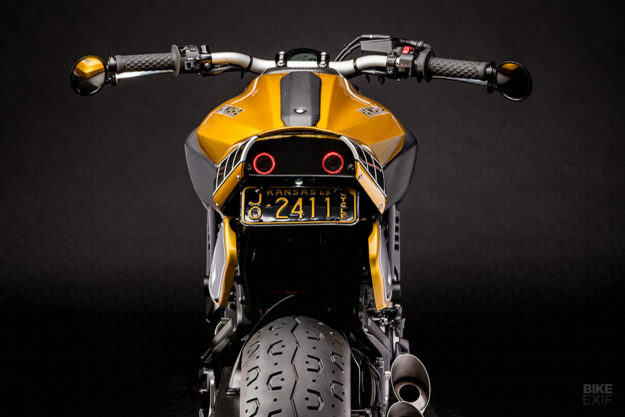 It uses a pair of slash-cut Cone Engineering mufflers, drawing inspiration from the MV Agusta Brutale. Michael’s particularly chuffed with the headers, which run straight down for a more classic vibe than the curvy OEM setup. Greg used an aftermarket airbox eliminator with a K&N filter, then got 2WDynoworks to re-flash the ECU. The suspension’s been tweaked too—with a new shock and a cartridge kit in the forks, both from Öhlins. 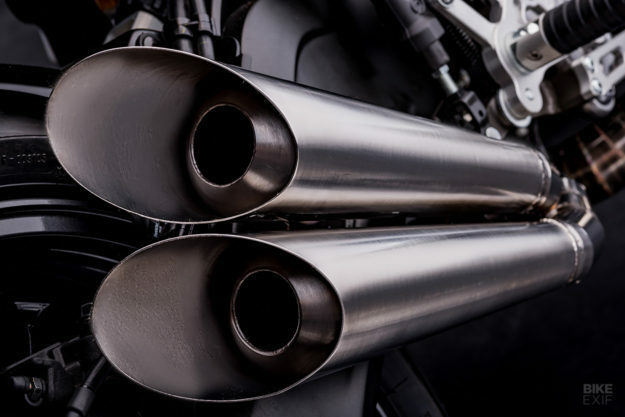 As a final touch, the crankcase and valve cover were stripped of their original bronze hue, and powder coated satin black by Joe at ProFab in Tampa. It’s the sort of change you’d only spot if you knew the original bike inside and out. 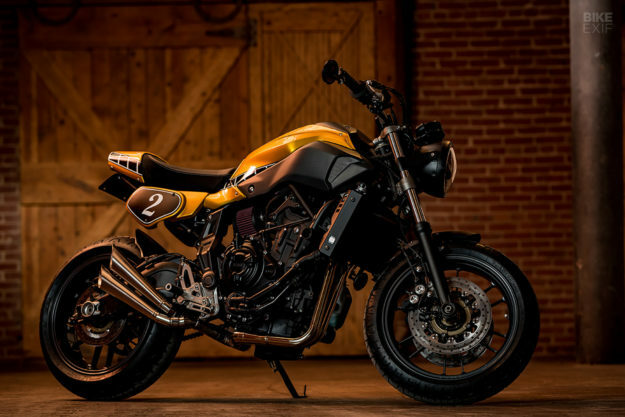 With the MT-07 in Michael’s garage, we’re pretty sure his other Hageman MC bikes are going to start feeling neglected.